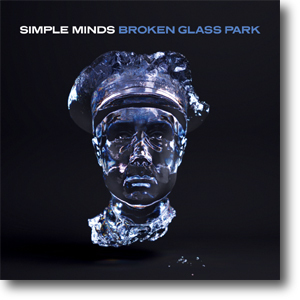 Broken Glass Park was the lead single from the Celebrate: The Greatest Hits + compilation album. The song was well known to fans as a live favourite. It was first premiered at the first Lostboy! AKA concert at the ABC2 in Glasgow on the 18h May 2010, and was a contender for the second Lostboy! album. By September 2010, it had switched allegiance and was now a Simple Minds track. It was first considered the lead single, and one of several bonus songs, for the Greatest Hits + of 2011. Unfortunately that release was postponed, but the song was played live during the Greatest Hits Forest Tour and was released, in live form, on the accompanying Simple Minds Live 2011 CDs. The long awaited studio version was finally exclusively played on Ken Bruce's BBC Radio Two Show on the 11th February 2013 where it was used to promote the newly remodelled Celebrate: The Greatest Hits +. Single-track promos of the song in a smart custom promo sleeve were distributed in February. Some included press release stickers. A video was also produced. This was the band's first compilation video, mixing shots of Glasgow landscapes and band-related landmarks with early TV and promo video visuals of the band. It was Radio 2's Record Of The Week during the last week of February 2013. It was then added to the 'B' list the next week and was promoted to the 'A' list the following week. The artwork was later reissued for the Promised U A Remix 12" single. No commercial, virtual or physical release was ever forthcoming: the single just existed as a promo to promote the album. It was later referred to as an Airplay Hit . A US promo version was produced in September 2013 to promote the forthcoming US tour. However, the concert details on the back of the cover were incorrect and all copies were withdrawn. This CD also featured the exclusive Radio Compressed Mix of the title track.